This year, LG will launch 4K OLED TVs with HDMI 2.1, the first 8K OLED TV, and the first rollable TV. Here are our first impressions after having spent some time with the TVs, along with technical information about the HDMI 2.1 features and more. 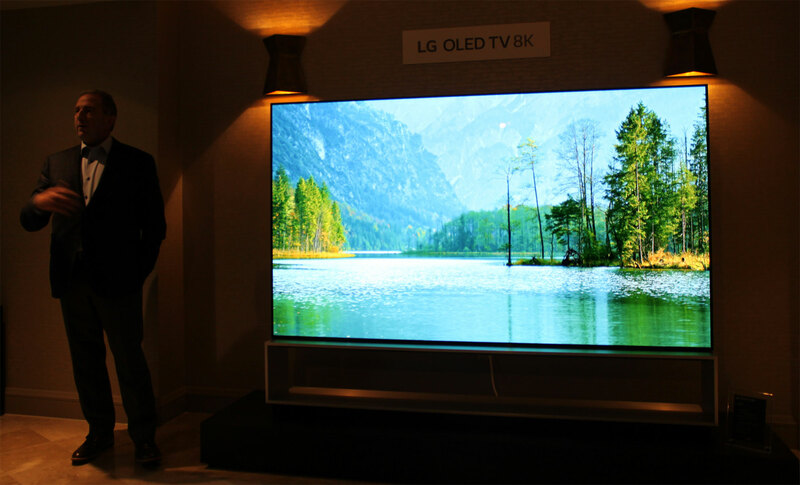 The most impressive TV at CES was, in our opinion, LG’s rollable OLED TV. That is why we awarded it Best of CES 2019. Before moving on the mainstream models, we want to take a moment to share a little more information about the impressive TV. Dubbed R9, the TV can roll up into a box with a built-in music system (and Dolby Atmos). The TV has three modes, including a partially rolled up ‘line view’ that displays music playback information, weather forecasts, and more. Last year, LG Display showed off a prototype that was capable of rolling up partially in order to eliminate black movie bars but this feature has, sadly, not been implemented in the final consumer product. And while the technology can technically be flipped on its head to imitate a projector screen rolling down from the ceiling, the R9 cannot be installed this way. LG claims that the OLED panel can sustain 50000 cycles, which corresponds to turning on and off the TV approximately 5 times per day for 26 years. 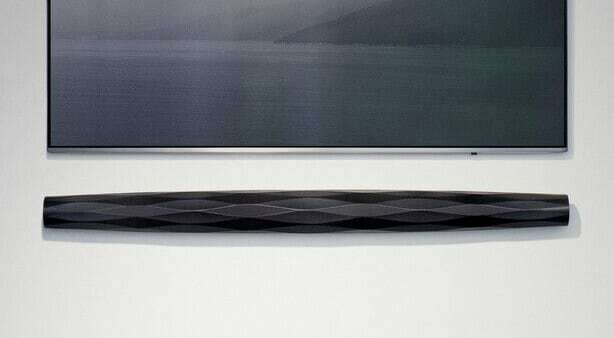 The company also said that the TV delivers the same picture quality as the other 2019 OLED TVs, despite being rollable. OLED can be deposited onto various substrates, including glass and plastic, and in fact many OLED panels implemented in smartphones, watches, TVs, and other types of products are flexible to some degree, if they were to be removed from the rigid casing. During our time with the TV, the claim of identical picture quality certainly seemed to hold water. Picture quality was excellent but it is impossible to say whether pixel faults or other errors will pile up over time. 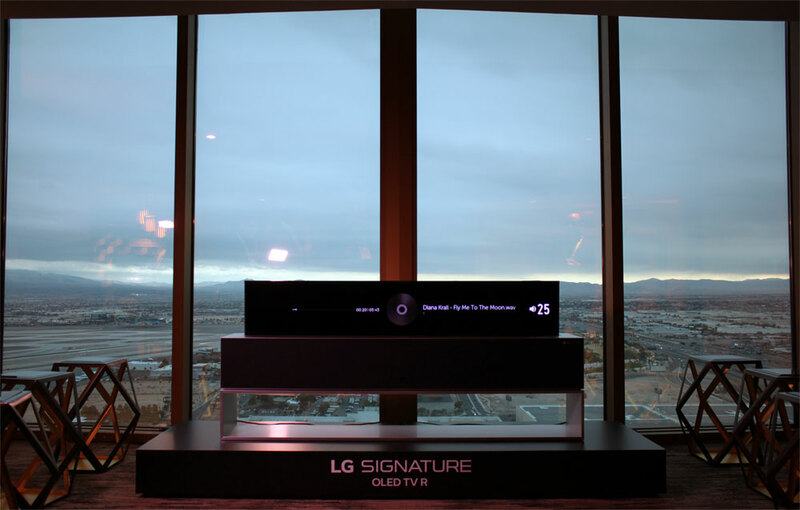 The TV has been designed to look pretty from every angle, LG said. All driving electronics are hidden inside the box so from the side or back the TV still looks elegant and extremely thin. The two support arms blend in gracefully with the patterned back. 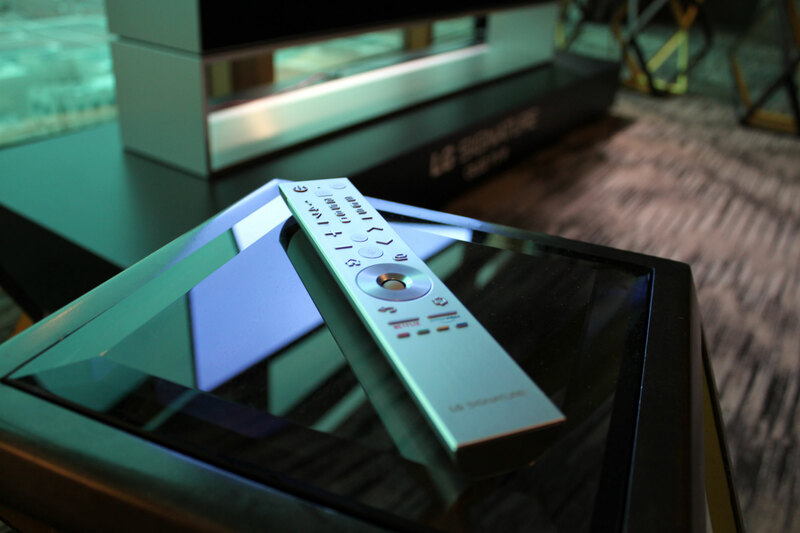 For its 2019 Signature TV line-up, which will include the rollable R9 and the “wallpaper” W9, LG has designed a new remote control. Pressing the remote’s ‘on’ button will wake the TV from its slumber. It takes only a few moments to fully roll out the TV; fast enough to be practical and slow enough to impress. 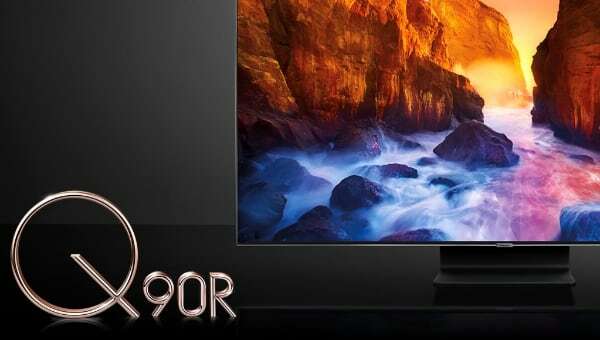 R9 is a real product that will be available as a 65-inch model. And while it is expected be more expensive than even the wallpaper model, this is just the first step. Imagine the possibilities – not only for TVs. The LG B9 was not showcased at CES 2019 but C9, E9 and W9 were. 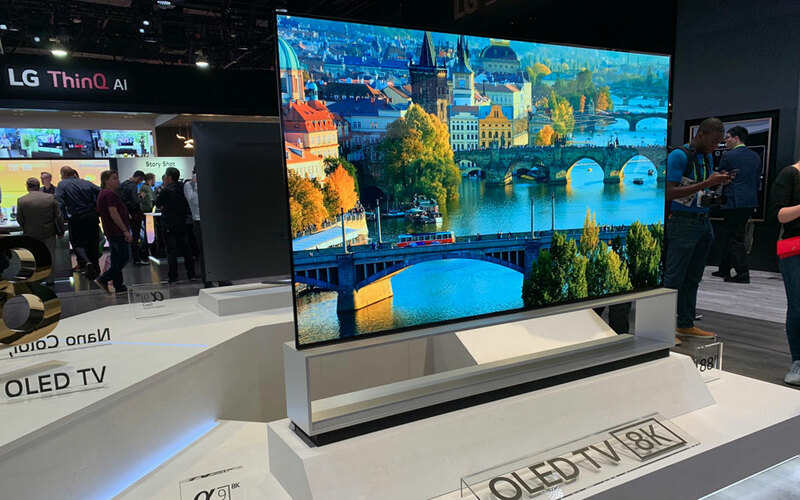 These are 4K OLED TVs with all of the latest features that the Korean company highlighted at CES 2019. In our initial report, we gave you exclusive information such as the input lag figure so let us focus on the new HDMI features first. The headlining feature is HDMI 2.1. While most other brands are planning to reserve full bandwidth HDMI 2.1 ports for its 8K TVs, LG will include it in its high-end 4K TVs, too. Not only that, all of the HDMI ports will be full bandwidth 48 Gb/s HDMI 2.1 ports, the company told FlatpanelsHD. 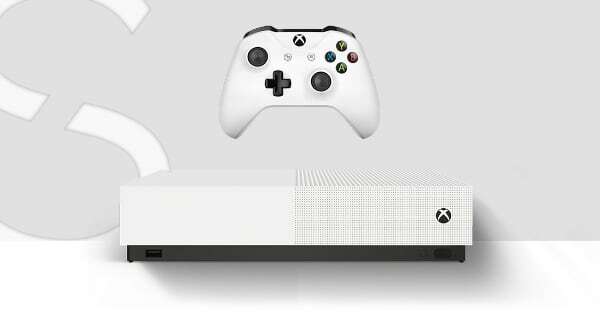 This enables 4K at 120Hz via HDMI input and while it is still early days, we expect 4K120 to be an important step forward for gaming. We touched on the subject last year and the short version is that in order to enjoy the full benefits of high resolution, video frame rate must increase accordingly – perhaps even beyond 120fps. To demonstrate what we mean, watch this slow-motion footage of 120fps HFR (High Frame Rate) that we shot last year. LG’s 2019 TVs will also support optional HDMI 2.1 features, including HDMI eARC (enhanced Audio Return Channel) that will enable output of lossless audio via the HDMI port to an eARC-compatible soundbar or receiver. We asked LG to clarify what will be possible and the company explains that eARC in the TVs support lossless audio output as well as lossless audio pass-through. What this means is that you can connect your UHD Blu-ray player directly to the TV and have the TV pass-through i.e. lossless Dolby Atmos (in Dolby TrueHD) or DTS:X to an eARC-compatible audio system such as a soundbar or receiver. 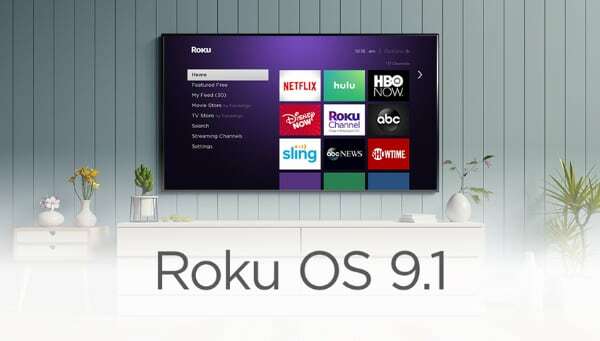 You no longer have to loop all of your source devices through a receiver that may or may not offer pass-through of HDR10, HLG and Dolby Vision. The TV can replace the receiver as the audio control center. The new TVs will also support two other optional HDMI 2.1 features, namely VRR (Variable Refresh Rate) and ALLM (Automatic Low Latency Mode). VRR is an HDMI specification that serves the same purpose as FreeSync and G-Sync. So-called adaptive or variable refresh rate ensures a smoother game experience with lower lag and other potential advantages. The game console or PC must also support HDMI VRR. ALLM is quite simple. It lets the TV automatically switch into game mode whenever a game is detected. The source device (i.e. game console) must also support ALLM. The TV will switch to game mode only when the game console loads a game – not when it loads the Netflix app. ALLM is currently supported by Xbox One but not PlayStation 4. However, Sony has implemented a custom solution that transmits a trigger signal via the HDMI InfoFrame. Initially, only Sony TVs reacted to the custom trigger signal but LG has discovered the trick and implemented support. It is not ALLM but the concept is similar. Making the rounds at CES, we also asked TV manufacturers about one of the most overlooked optional HDMI 2.1 features. QMS – or Quick Media Switching – eliminates the black screen when switching between frame rates. If you own an Apple TV 4K and have ‘match frame rate’ activated you probably know this effect. QMS has the potential to finally make frame rate switching on TVs seamless and as such it has the potential to create an environment where TVs, operating systems, playback devices etc. can finally move past all of this speed-up, pull-down, frame conversion baggage that has hampered the TV ecosystem for decades. And the answer? Well, it’s complicated. Even the HDMI group could not give us a clear answer, partly because they cannot comment on specific products or brands, but they informed us that if a TV supports VRR, it is very likely to be capable of supporting QMS, too. However, in the end it is up to the TV manufacturer. LG was not able to confirm or deny but informed us that there is a meeting with the HDMI group in February where QMS is one of the talking points. As we approach launch in spring, we should have more information. That was a lot of talk about HDMI 2.1 but this is important, folks. It is important to understand that HDMI 2.1 not only makes possible significantly higher bandwidth but also some exciting features that are optional. You cannot conclude that because a TV has HDMI 2.1, it will automatically support all of this stuff. There are many other factors to take into consideration. LG’s C9 has a new stand but aside from that it looks largely unchanged. LG’s E9 has a slightly refreshed design. It still consists mostly of glass and it is meant to cater to the more design conscious buyers. 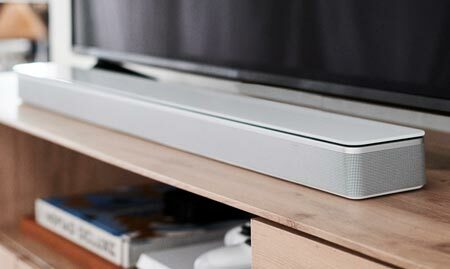 W9 has an external soundbar that includes all driving electronics but from a design standpoint it is identical to the previous W8 and W7 “wallpaper” models. A separate game function that can be activated for all picture modes (should provide same low 13 ms input lag). LG has improved its black frame insertion system so that it now runs at 120Hz with 25% cycles. This should, according to LG, eliminate flicker and maintain brightness compared to last year’s models (60Hz with 50% cycles). We have seen it in action and it looks very promising. It appears to work as intended. The company is also highlighting an improved ambient light sensor system in its 2019 models. For HDR, it can now change the tone mapping to raise shadow details if you are watching HDR video during daytime. For HDR10, LG has developed its own algorithm, while Dolby has developed something similar for Dolby Vision that makes use of the dynamic metadata. It is optional to use and is part of the LG's ‘AI Brightness’ feature. LG will introduce new features in its webOS operating system this year, including ‘AI Preview’. It simply means that you will see content previews in a row atop the Netflix icon – and a few other services. It pulls content to the forefront for easier and faster access. 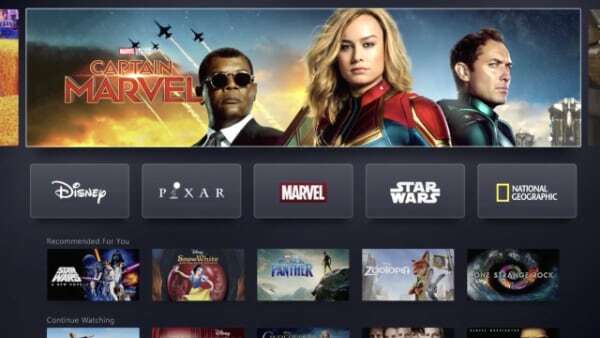 Streaming providers must each take advantage of the new API tool to enable their app for ‘AI Preview’. LG has no plans to add this feature or other new webOS features to previous models. Two other new exciting features for the 2019 OLED TVs are Apple Airplay 2 and HomeKit. Airplay 2 enables you to push video, music, and other media from an iPhone or iPad wirelessly onto the TV screen, while HomeKit is Apple’s platform for the connected home. We have detailed some of the possibilities here. 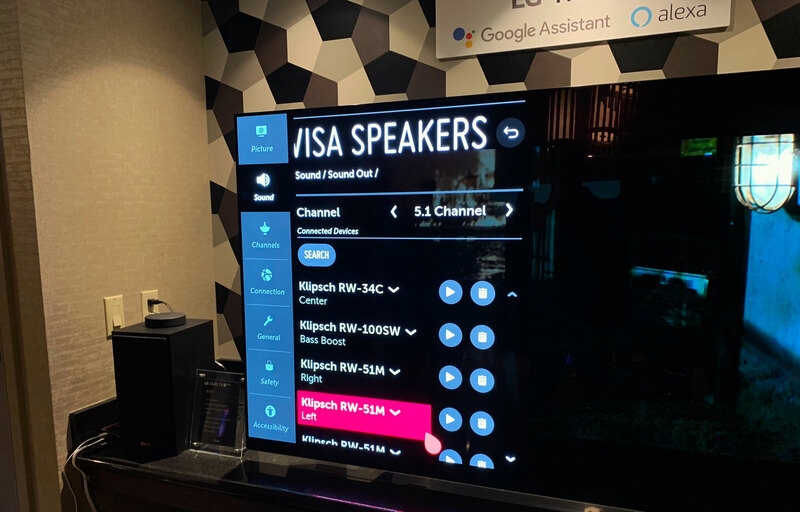 There is also built-in WiSA, which is a wireless audio protocol that enables you to connect WiSA-enabled speakers wirelessly to the TVs. LG explains that the current implementation supports up to 5.1 surround but not yet Dolby Atmos. There is a new menu in the TVs to help you set up WiSA speakers. To get started you need a small dongle that is sold separately. Together with CalMAN, LG has furthermore implemented test patterns for calibration. This is a feature for enthusiasts with a meter and the CalMAN software but it greatly reduces the entry price for auto-calibration as you no longer need to invest in a quite costly pattern generator that sits between the PC and TV. More details can be found here. A more affordable and simpler version of CalMAN (Home) will also be released later this year. The 2019 OLED TVs will be based on more or less the same panel. LG explains that it has less aggressive ABL (Automatic Brightness Limiter) so whenever a bright color (i.e. white) takes up an increasing amount of the screen real estate, the TV will not dim as aggressively. However, Panasonic said the same thing so we suspect that it can at least partly be attributed to improvements in LG Display’s panel. LG Display supplies all TV manufacturers with OLED panels. LG also said that the panel has a more effective anti-reflective filter that is meant to more effectively subdue reflections from ceiling lamps (or open windows) but it was difficult to gauge how effective it is based on the less-than-ideal CES demonstrations. This is certainly not the first time that we have seen an 8K OLED panel. 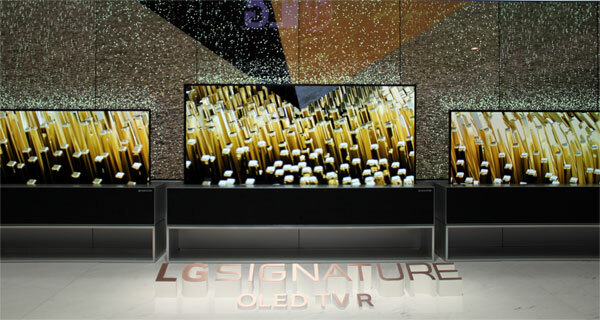 LG Display – the panel supplier – has showcased it on a number of occasions. 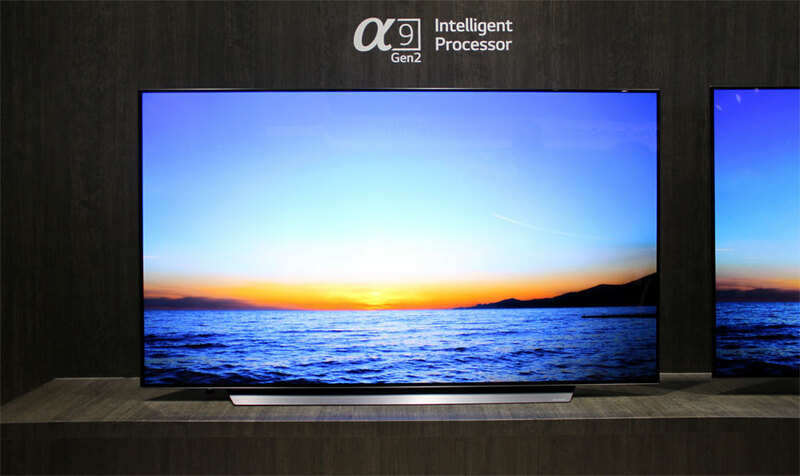 However, Z9 is the first consumer 8K OLED TV. Together with new 8K LCD TVs, it is also one of LG’s first 8K TVs. Besides the obvious advantages of 8K resolution, the Z9 will increase the maximum size of OLED TVs. Z9 will be available in 88 inches only and while we are not convinced that 8K is ready for primetime, the format should at least be large enough for you enjoy the more than 33 million tiny self-emitting pixels. Picture quality was amazing. Z9 has HDMI 2.1 and can accept up to 8K60 inputs. Like all other 8K TVs announced at CES 2019, it will not go beyond 8K60 to, say, 8K120, which requires video signal compression (and faster processors). This is new ground and it is close to the limits of what today's technology can do so it is only natural but know that HDMI 2.1 can theoretically enable 8K120 and that there will be a time when 8K TVs and video processors can push such data throughput. We have already highlighted the fact that there is almost no 8K content available on the consumer market and LG was not able to confirm if Z9 will be capable of handling YouTube’s 8K streams. We had hoped that industry players would use CES 2019 to announce 8K content initiatives but, alas, they did not. Upscaling will not get you anywhere close to native 8K quality so as long as there is a dearth of 8K content, it seems pointless to buy an 8K TV. 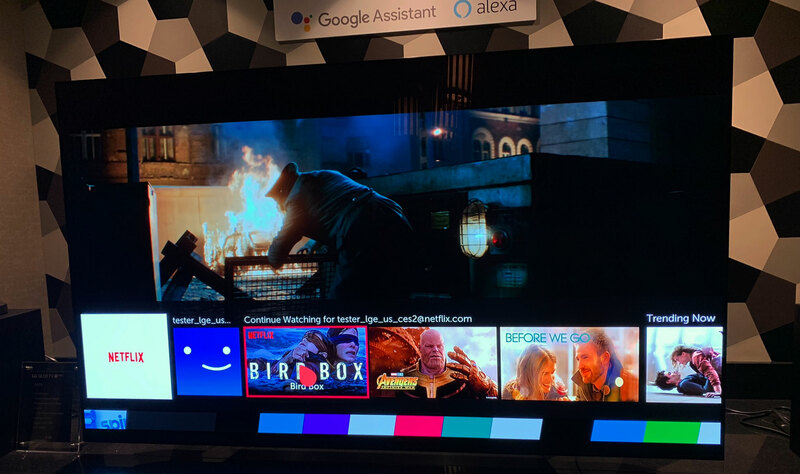 At CES, we saw a short 8K clip from a blockbuster movie and as discussed in our preview of Samsung’s 2019 8K TVs we suspect that the “24fps movie look” discussion will reach a tipping point as we transition to 8K resolution. We were particularly interested in finding out whether the 8K panel foreshadows new technology destined for future 4K OLED panels but it appears to be largely the same panel, just larger and with higher resolution. One would think that an 88-inch 8K OLED panel could be cut into four 44-inch 4K panels but LG Display was not ready to talk about smaller panels. 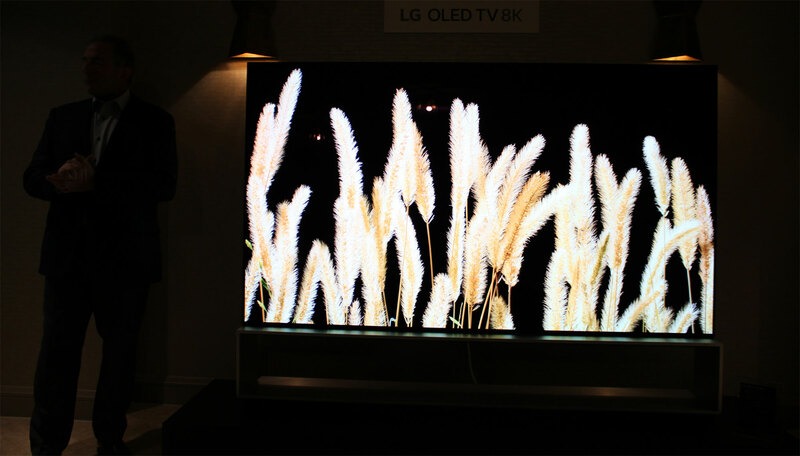 It did, however, confirm that the 8K OLED panel is still bottom-emission. The company is not ready to move to top-emission that provides benefits such as higher brightness throughput and improved power efficiency. Other than that, there is probably not much else we could add to the conversation of 8K at this point. 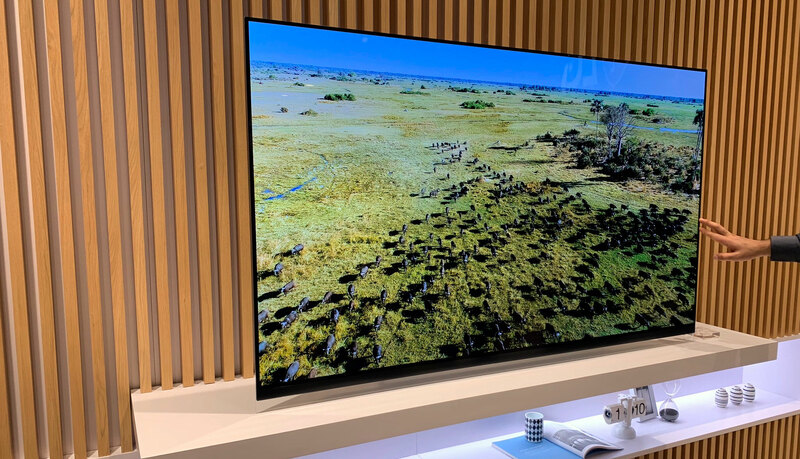 The TV will be available in the second half of 2019 so LG may decide to tweak things before launch but it appears to have largely the same feature set as the 4K OLED TVs. Z9 do not support HDMI VRR at 8K. The launch of 8K TVs at CES 2019 honestly left us a little concerned and with lots of unanswered questions. Is the world ready for 8K? Where is the content? What are they not telling us? And we expect Z9 to be very expensive. We will bring you more information about the 2019 LG TV line-up closer to launch and hope to get our hands on samples as soon as possible. Subscribe to our newsletter for the latest news.